When the opportunity came to review K5 Learning, a new educational online program, I was not excited. In the past I have found such programs to be more focused on “fun” than on actual “learning”. What a lovely surprise to find K5 different from my previous experiences! K5 Learning was designed to be an online after-school study program for children in Kindergarten – 5th Grade. K5 Learning includes reading, spelling, math and math facts. K5 Learning uses an assessment that focuses on 8 key skills and places your child at the appropriate level. Placement based on ability and not age and grade makes K5 an excellent enrichment program! The lessons are engaging and fully independent. Clear instructions were given and adequate time for response prevented frustration. K5 let’s the child set the pace by having the child select “go on” or “next”. You can view sample lessons for each area of learning and grade at K5 to see first hand how the lessons are conducted. K5 Learning is a safe environment for online learning. It does not provide chat, external links or advertising. Your child can focus on the task and not be tempted to click elsewhere. Another great feature about K5 Learning is no games, tokens or other rewards need to be “earned” . It is refreshing to have the creators of an online learning program realize that all the “bells & whistles” are not needed to motivate learning. Learning itself is a great motivator as well as parental encouragement. And K5 allows parents the ability to track and guide learning. 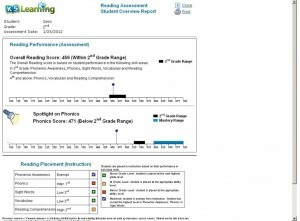 Progress reports are easily accessed and clear in presentation of information. Parents can also assign which lessons they would like the child to complete or personalize spelling words. I was pleasantly surprised with K5 Learning. It is a lovely compliment to our homeschool. I utilized the program for my 6yr old and 8 yr old daughters. During the time that I was working with my older students, my younger girls rotated computer time on K5. They were having fun and learning at the same time; building basic learning skills. My 8yr old loved the math facts and the reading. My 6 yr old always went for the math lessons first. 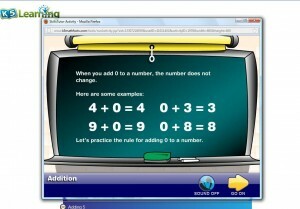 As one who is cautious of online programs, I loved K5 Learning. I think K5 does exactly what it promises. It has been enjoyed in our home. K5 provides thorough information at K5Learning.com . I recommend browsing the site, reading the FAQ and watching the sample lessons. Then take advantage of the 2 week free trail! For our family, the pricing is out of our budget. While I think it would be more realistic for families to lower the price, I also understand the cost of running an online program. By not allowing advertising, the cost must fall on the consumer. Please take time to swing by the Crew and see what others think of K5 Learning. **Disclaimer: As a member of TOS Review Crew, I received a complimentary 2 month subscription to this product. No compensation was made. The opinions expressed in this post are my own. This entry was posted in TOS Crew Reviews and tagged computer, curriculum, Homeschool, math, reading, review, sisters by sweetie. Bookmark the permalink.